Visit Our Library And Make It A Habit! 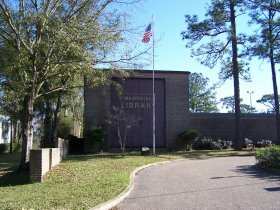 The Chickasaw Library sells a selection of used books. Book it to the Library for Craft Day! Join us for a fun filled time that puts your craft skills to the test by giving new life to old books. There will be activities for all ages and skill levels. We’ll provide the books and your encouraged to bring your choice of supplies along with your imagination! Call 452-6465 for upcoming events. our reading program at the Chickasaw Library. Contestants can enter in 3 age divisions. K5-12th grade. Winners must live in Chickasaw and will be given a season pool pass to Chickasaw Pool as reward for most books read. Call 452-6465 for details/registration. In order to obtain a library card, an ID must be presented at the time of registration. Chickasaw residents with proof of residence such as a driver’s license and/or a bill with address will receive free membership. Non-residents must pay a one-time fee of $10 and present ID. Junior Library Cards are available to youth ages 6 thru 14. A parent or guardian must fill out a form claiming responsibility for any items checked out by the child being registered for a card. Children’s Story Time takes place once a month; the selected title and date of the reading are announced on our Facebook page. The Library is striving to incorporate more Story Times and encourages storybook suggestions or volunteer readers. See you at Story Time! We are proud to announce that the Ancestry Library Edition database will be available to our patrons through our computers and Wi-Fi. Access this FREE service by visiting the Library, and research your Genealogy, family trees, and family history.